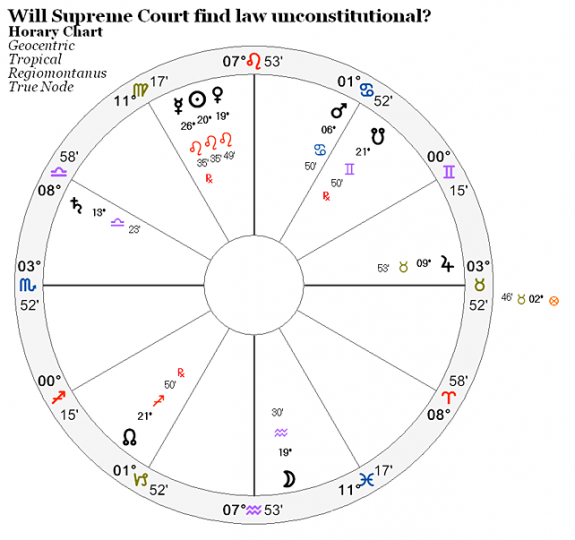 Home Astrological Charts	Will Obamacare be considered unconstitutional? Will Obamacare be considered unconstitutional? A horary about the passing of high level legislature asked in 2011 when the law was sent to the USA supreme court by the Republican party for assessment. The querent is intensely emotional about the situation and dislikes the new law and dislikes Obama, and sides with the plaintiff so I read this as an “us against them” chart. Therefore the querent and her party are Mars, ruler of the ascendant. Those who want the law upheld are “the enemy”, Venus, ruler of the 7th house. The supreme court is the Sun, ruler of the 10th house (court/authority). Saturn is the Verdict (end of the matter), ruler of the 4th house. The Moon translates light from Saturn to Venus, so Venus wins: “the enemy” wins. The law will be found constitutional and will be upheld. The law was found constitutional and was upheld by the supreme court. Will I give a natural birth without complications? Did caffeine hurt my back?